Is it a closet or a dressing room? 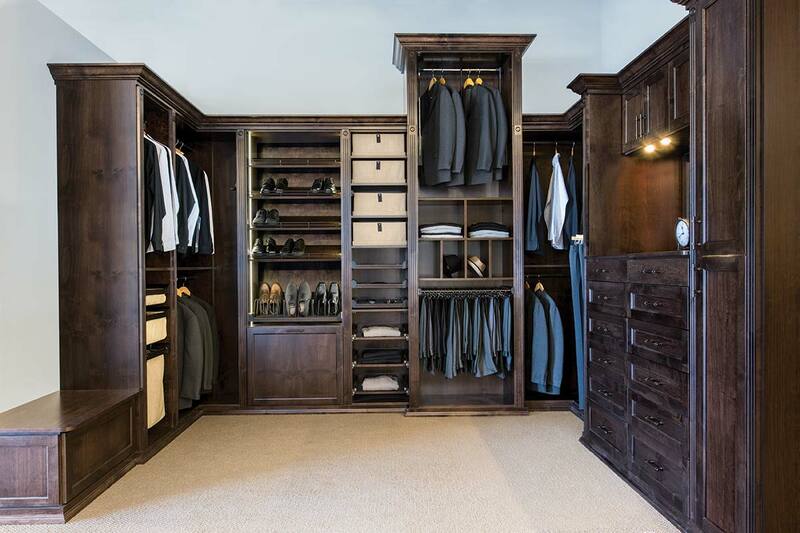 This elegant custom closet for Him blurs the line by satisfying both functions. 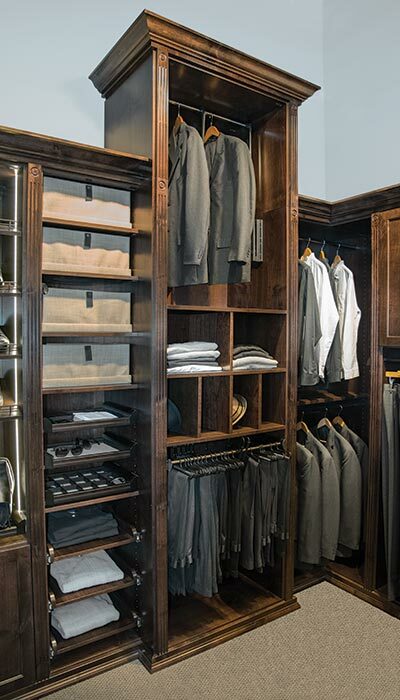 The closet and dressing room design was created from all wood components — solid wood door and drawer fronts with wood veneer over composite material for the larger structural pieces and countertop. The composite offers greater strength (which means it can support more clothes) than solid wood boards and is available in wider widths. The closet includes several areas for hanging clothing, including a center tower unit meant to take advantage of the twelve foot ceilings. 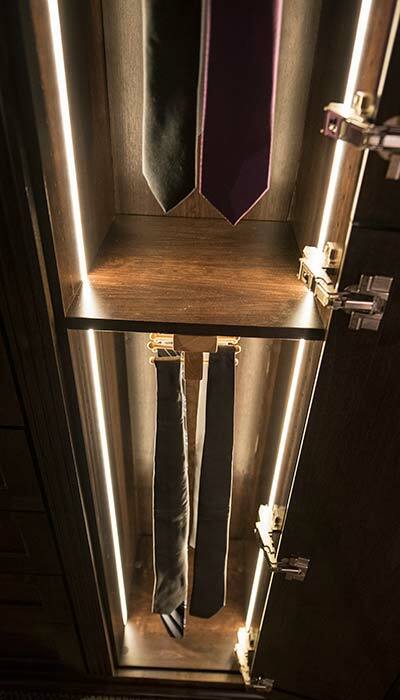 A pull-down closet rod allows for easy access to the suits stored their. Did you know that being organized can add hours of extra time onto your day? 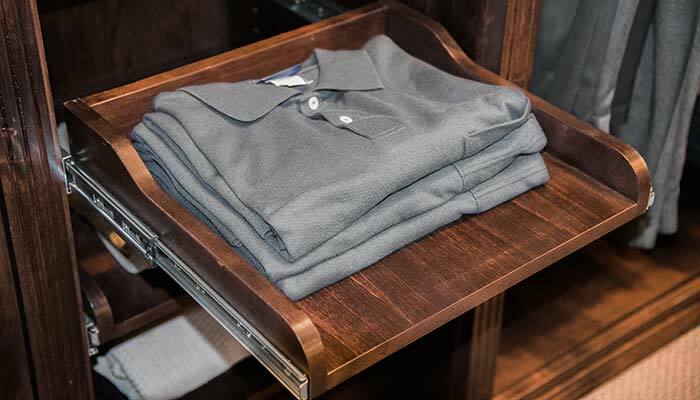 Having numerous sections dedicated to hanging clothes like the design offered by this closet makes it easy to separate clothing by function or season, allowing for better organization. 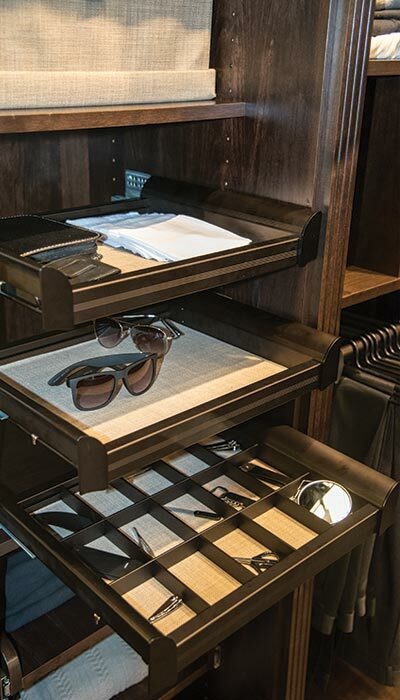 Organization is further enhanced by the inclusion of numerous closet accessories. 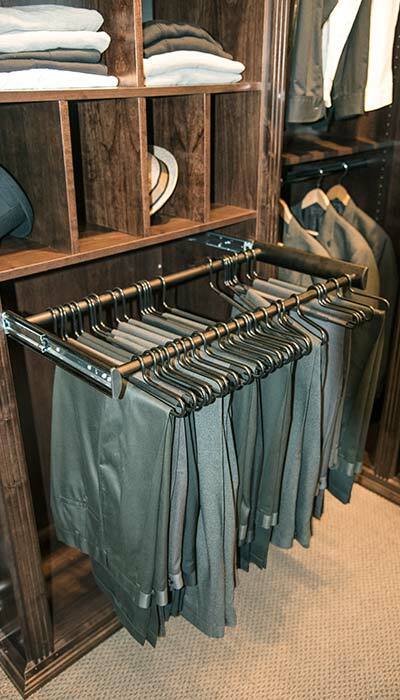 A pull-out pant rack comes with 18 hangers but can be expanded to even hold more. 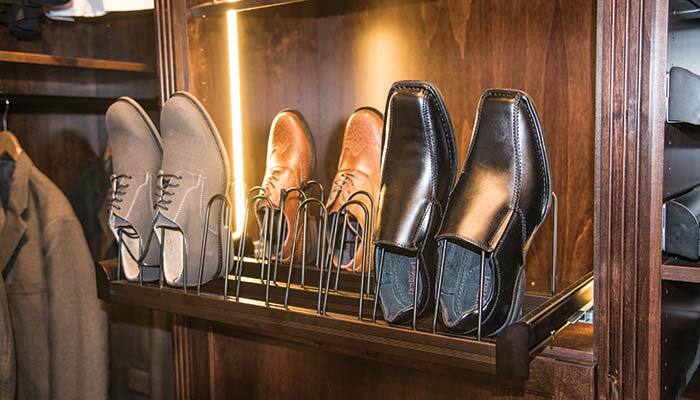 The slanted shoe shelves with shoe fences store the dress shoes, while a pull-out shoe organizer handles casual and weekend foot ware. 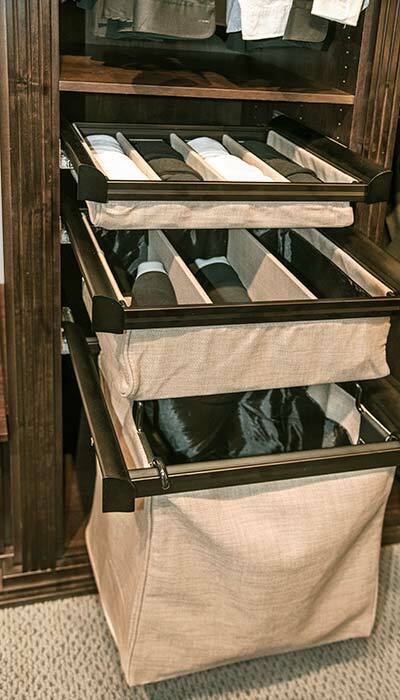 A series of four cloth boxes makes for an attractive way to corral items you might wish to store on the shelves without creating a lot of clutter. They even come with lids for dust free storage. This closet design including several pull-out closet shelves and cloth closet drawers with dividers — meaning things won't get lost in the back of the closet. The double closet hutch with twelve drawers on the bottom and two cabinets above takes the place of a traditional dresser, meaning less furniture is needed in the bedroom. The countertop provides as much surface area as a typical closet island, but takes up less space. Finally, in order to be considered a dressing room, this space needs to include seating. The built-in chest with cedar lining is a convenient place to sit down and put on shoes, or just rest a moment before starting your day. Leaving the center of the floor and one side of the closet open, as in his design, means that additional chairs, or even a desk, can be pulled in depending on the homeowner's needs. Closet tower creates extra storage for room with 12 foot ceilings and a pull-down closet rod accessory is used for access. LED strip lighting adds an instant WOW factor and confirms that this is truly a dressing room rather than just a closet.